Before creating your character you need to decide what alignment you are going to play. While you can choose at any time to change alignment, (until a certain point of no return which will be pointed out in the walk-through) it is best if you choose one alignment and stick with it. You gain certain bonuses for maxing out your alignment either way (PC version only), and certain items can only be equipped by characters of one alignment. Changing alignments midway has no advantages whatsoever, as you may not even be able to hit your mastery if you change too late in the game. Also remember that your mastery is temporary, meaning that if you ever lose your mastery then the bonuses associated with them will disappear. Also if you want to maximize your character's efficiency you will want to know the bonuses associated with each alignment, so without further ado here they are. The Light side is all about bonuses and increasing the Jedi's power and the power of his or her allies. The entire mentality is that of benefiting people, whether it be mastery bonuses or the force powers employed by light sided Jedi. Buffing up your characters, increasing their stats, and healing all are exclusively light sided powers. Equipment that can only be worn by light-sided characters mainly increases one stat, namely wisdom. 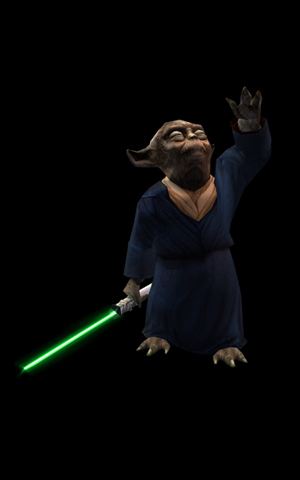 Because of this Light sided Jedi�s force powers can be more difficult to resist, and they can resist powers cast at them more easily. Masteries for the light side are also of a buffing nature, increasing the main attribute that is most beneficial to their respective Jedi classes. Each of the attribute bonuses are covered more fully in their respective sections. Increasing the main attribute for any class is beneficial, and the light side mastery bonuses are especially useful and fit their respective classes very well. The Light side has the easiest time increasing and buffing their attributes. This is especially true of Wisdom, as stated above. 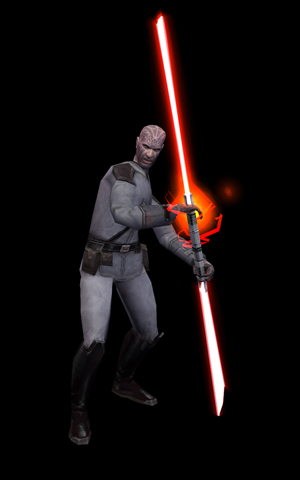 They also have access to the Solari Lightsaber crystal, one of the most powerful available to a Jedi. The downside to all of this is the lack of offensive force powers. The Stun droid is the only directly offensive force power. They have no force powers to call their own against organic opponents. They can stun, but not kill or maim. While there are neutral offensive force powers they can use without penalty, they receive no bonus either. This means that while force wave is good for dispatching groups, they have no force power to use against tough bosses. Aside from this there is the problem with cash. Helping others and choosing the light path out of the goodness of your heart does not bring in any dough. Indeed to truly follow the light side, you will be spending cash to help those in need. This can lead to financial difficulty, so you need to watch your credits carefully. You cannot act rashly or selfishly, leaving many dialog options unavailable to you. Threatening others also leads to the dark side which may leave you with no means of gaining information if your persuade skills are not high enough and if they lack the affect mind line of force powers. Finally on a different note, the bonus for light sided guardians is not as powerful as the bonus granted to dark sided Guardians who receive a direct increase in damage output. The dark side is all about destruction. No need to buff if your opponent falls before they have a chance to act. Incapacitate, debilitate and wreak havoc is the dark Jedi mentality. Who needs allies when one has oneself. The dark side has the most powerful offensive spells ranging from force storm which targets all of your enemies for massive damage, to force kill which can debilitate even those immune to paralysis and reduce the health of even the most powerful foe by half, resulting in a guaranteed death if it connects twice. On top of this are the powers granted if you master the dark. Increased damage and ability to cast more offensive powers are always welcome. Dark guardians can have an unparalleled damage output, even more so when they equip the most powerful robes a dark guardian can wear. Dark sentinels are immune to practically any status ailments, and dark counselors have the most force points and largest arsenal of offensive powers that can be cast. But this is not all, not by any means. There is no need to adhere to weak ideals that make the simpering Jedi give up money and power just to "do good" as it were. You can threaten, bribe, extort money all at your own will and pleasure. This means that you will always have enough credits to do whatsoever you wish. There are also many powerful items that can only be gained on the path to the dark side. While some may hate you or deny you, none can withstand your sheer power. Finally darksiders receive snazzy new undies to wear. Unfortunately the dark side is not without drawbacks. Besides looking like a vampire with varicose veins (which some would consider a benefit) there are some more obvious downsides to dark sided Jedi. Firstly darksiders do not have direct access to hardly any buffing powers. The few neutral ones that they can use without penalty are mainly for fighters, leaving dark counselors wanting. They also have no means of stunning or incapacitating droids. Force lightning is effective as always, but the only way to stop them from moving is to destroy them which I suppose all well and good, unless they respawn indefinitely. Healing can sometimes be a problem, for while drain life is useful, if there are no organic opponents about it can leave one wanting for health. Another issue is that all of the equipment with a dark side requirement is designed for fighters in mind. Nothing exists to increase wisdom for the dark counselor making their powers more easily resistible relative to the fully decked out light sided Jedi counselor. Especially at higher levels, where all of your opponents have high resistance, it can be a huge pain. The mastery bonuses sentinels and counselors are not quite as beneficial as they could be. Sentinels especially do not particularly need poison immunity, as antidotes are cheap and plentiful and there are many other cheap sources of poison immunity. Dark Side Consulars will find the extra force quite useful, but it still doesn't help with the fact that their force powers are more easily resisted than light sided Jedi. While extra force points are always welcome, it does not help as much as an increase in force power DC. Because the +3 increase in Charisma for light sided Jedi means means up to 36 additional force points* (depends upon Jedi level), along with a higher DC. That means you are trading 14 - 28 force points, for making it more difficult to resist, which I feel is a fair trade. Remember that Dark Jedi do not have any equipment that increases wisdom or charisma, the only means of increasing force power DC, therefore this difference hurts even more. Upon first glance, the neutral path might seem without any benefit at all whatsoever. You do not have any masteries or bonuses to any force powers. The Solari lightsaber crystal is still off limits to you, as are all other alignment specific items, (especially the nice new robes you get near the end). This does not bode well for the Grey Jedi. However there are some unseen benefits that Grey Jedi get. Firstly they can use any force powers with impunity. While they receive no bonuses, there are no penalties either, giving them free access to any and all powers. Secondly, unlike light sided Jedi they don't have any money problems either. By accepting rewards as they come and by not giving out much they have nearly as much ability to gain money as the dark side, without all of the negative reactions that might be produced from the darksiders actions. Helping people for money is always neutral so people will like you AND you get a profit. This leads to great freedom to play as you wish. No need to adhere to strict good or bad behavior. Light and Dark siders often need to continue to do good or evil deeds to make sure to maintain their mastery bonus, but there is no such fear for a grey Jedi. This leaves much freedom to complete quests for both light and dark, and allows for the most freedom in action. Keywords for Grey Jedi are freedom and balance. Grey Jedi are best suited as counselors, as guardians will have more bonuses and a better equipment being either fully light or dark. On the downside, there is one point in the game that practically forces you to not be a neutral, though there is a way around it if anticipate it and you know how (it's still a real pain in the rear though). All in all it boils down to personal game play style and role play aspects, as the benefits and weakness all balance quite well. Lightsiders gain the respect of their comrades and great attribute bonuses, but lack in offense. Darksiders have great offense and have no money problems at the expense of buffing powers and respect of others. Neutral tries to have the best of both worlds, but lacks in good equipment and bonuses. The above is not trying to convince you to play light or dark, but is setting forth the advantages and disadvantages of both sides so that you can choose for yourself what you really want. Note that while any Jedi can use any force power, it comes at a tremendous cost, therefore those force powers no longer become viable as common tools. A light sided Jedi can cast Choke, and a dark sided Jedi can cast Heal, but the cost is greatly increased. As such when I say that they do not have access to, I mean to say that access is restricted, because of FP cost. As a final note from what I understand the XBox version lacks any bonuses for masteries, so any information relating to that should be ignored when choosing an a alignment.